Charlie is a four year old Jack Russell Terrier. He gave a down payment on our hearts at the age of seven weeks, and has long since paid off his mortgage. After a quick reconnaissance, he took possession of a favorite couch, a reserved space in our bed, and laid claim to which times of day he is ready to walk, eat and play. He is fearless, but always keeps a lookout for a quick return to safety after surveying the yard. He is territorial, and takes offense at squirrels and mourning doves should they be foolhardy enough to feed on the orange trees or bathe in the birdbaths. He is excessively friendly, and has never met a stranger he did not love. I would not feel happy nor whole without a dog at my heels. Many dogs have owned us over the years, dogs of every size and temperment and intelligence. There has always been a dog to lay by my feet while I made art. Dr. Advice consulted a loveable Doberman who helped out in his office for many years. He made an impressive appearance, but was actually a coward. One or more eager companions hiked along with us over many a fishing trail, chasing butterflies, lizards and digging in delicious- smelling burrows. A little chihuahua, and a wary dachshund once tiptoed past a herd of cows on their way with us to a fishing stream, wide eyes showing whites darting from side to side. A beloved German Shepherd lay on my bed with me daily during a long period of illness, giving comfort when I simply needed a furry head to hold, and a non-judgemental complaint department. They have walked quietly by me while I worked out difficult sculpture problems, and have taken credit for whatever solution I came to. Dr. Advice had a long love affair with a kind and gentle Old English Sheepdog who walked miles with him everyday. 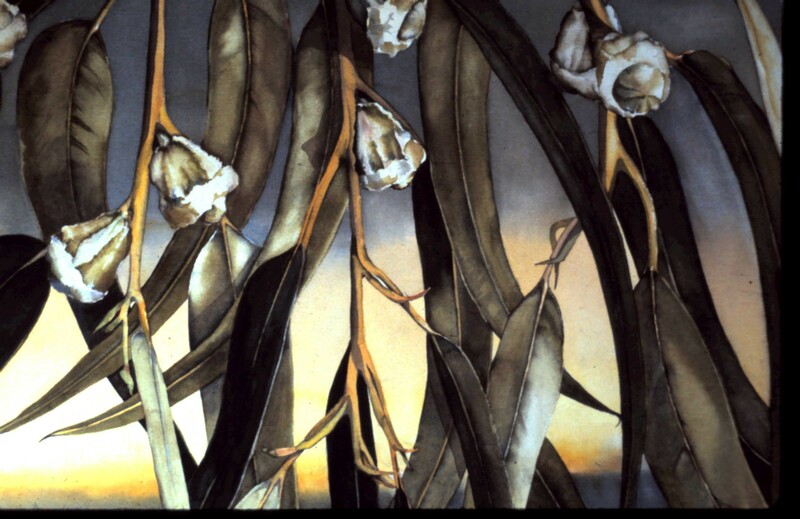 Each has taken a special place in memory, whether from their sweet or from their aloof personality. I have never for a moment believed that Charlie was simply a dog. He divines everything we think, and is quick to suggest solutions to problems. He is a student of our sloth, and his prescription for it is a nice long walk. He has his own ideas as to how the world should be managed, and it is usually in his favor. He was not an easy puppy to train, and many days I wondered what act of evil ever delivered him to us. He never got over his opinion that he had the superior intelligence. But once subdued, he graciously accepts our decisions. When Charlie entered into our lives, we were told that a Jack Russell Terrier would either kill us or keep us young. It is not by accident that they are sometimes referred to as “Jack Russell Terrorists”. Well, aren’t dead yet! ( And neither is he.) The common belief is that every boy must have a dog to be responsible for, but to add to that, I believe that every older person would do well to enter into a contract with some sort of furry friend. Not to do so is to cheat yourself and the dog. Or cat if you must. I like Ferragamo shoes, trips to Paris with my daughters, caramel frappachinos at Starbucks, and McDonald’s. I don’t eat the food there, but the coffee is supreme, and the people- watching can’t be beat. The price of senior coffee is so fair, you wonder how they can make a living. The several McDonald’s in our city are all owned by our good friend, who by the way is the inventor of the quartrer-pounder hamburger and we are always greeted with familiarity. We are an ethnically diverse city, which sometimes leads to interesting conversatiions, and certainly broadens our view of travel destinations we will probably never take. I have a different understanding of the few homeless persons who sometimes wander in out of the rain to keep warm and buy an inexpensive meal. Young families can afford to bring small children in for a McDonald’s treat. A few people bring their laptops and work in a quiet out of the way corner. Two long-time employees who clean the place are refereshingly accomodating, and the maintenance man has become our maintenance man. One of the owners is godfather to his children. The small elderly cleaning lady from the Philippines has some health issues, and loves to tell me all about them. Her English is not good, so I only understand a word or two now and then, but enough to give sympathy when needed. She always gives Dr. Advice a small container of catsup when we are leaving, because I told her once it had licopine in it and was good for him. The man who does the tables on Saturdays is a former Marine whose hearing is nearly gone, and has some short term memory problems, but his knowledge of the Vietnam War is impressive. And I admit to having a certain amount of reverse snobbery when friends give me a pitying look while comparing their favorite coffee shops. Yes, I like McDonald’s, It offers more than fast food if you look. The sunlight that pops out from behind a dark cloud and decorates the trees with tiny diamonds after the rain, and the fresh smell of cedar in the forest, or the sound of seagulls quarrelling over an unlucky fish that somehow avoided your line, , are a small part of the attraction of the Northwest for avid fishermen. For a number of years we had explored many of the good fishing streams in Oregon, Washington, and British Columbia, and in 1969 we succumbed to the siren call of the Northwest coast and moved north to Seattle, Washington. A company transfer and the fact that our youngest daughter had been accepted to the University of Washington, made the idea viable. Our oldest daughter, in school at San Jose State University, with a probable marriage in the near future, meant that our little family would be separated for a time. So we packed up our belongings, two dogs and a cat, and drove to a small semi-rural town near Seattle to a house we had found on a scouting trip six months earlier. We spent several weekends looking at various locations and had chosen this one for its proximity to both Dr. Advice’s work and the University. It had changed drastically in six months, and we drove past it twice not recognizing it. The grass was so tall it scraped our knees, and a jungle of wild blackberries sprouted over what we had remembered as a nice field. As enthusiastic do-it-yourselfers we had purposely bought an old farmhouse we could renovate, picturing a sheltered and peaceful country home with room for a small garden and eventually a barn to be used as a party area, extra guest sleeping and a studio. The 1 and 1/2 acre property had a number of fruit trees, a nice patch of large delicious raspberries, and lots of mature trees, all in need of a lot of care. It was surrounded by a white farm fence and was situated on a tree-shaded lane which led to two or three neighbors some distance away. At the end of this lane lived an old Swedish man who had built our house for himself. Though he had lived here many years, and had built several of the houses along our road, he still spoke quite broken English, which seemed charming to me as if we had been transported to another country instead of merely a few hundred miles north. It had pasture on two sides and no close neighbors. We were within a short walk to the Lake, and fifteen minutes from Seattle, where Dr. Advice would be working when he was not covering his territory of Washington, Idaho, Montana, Wyoming and Alaska. Not a bad location for a fisherman. When we unlocked the front door and went inside, it was smaller than we remembered, and would require a bit more effort and money than we also remembered. But it had large windows opening onto the green field surrounding it, and the bedroom opened onto a lovely wide porch sheltered by a large cherry tree, and a beautiful pink Hawthorne. Taking stock of the situation, we decided the roof was a first priority, and the realtor was helpful in recommending someone to do the work. When his truck pulled into our driveway, the dogs greeted a small, wrinkled old man of about 75, but looking older. Assuming him to be the estimator, I was surprised when he quietly took stock of the situation and announced that he would come in two days, bring the shakes, and would teach us how to put the roof on. We have a certain degree of skill in doing inside repairs and decorating, but a roof! Horrors! Worse, in two days time, Dr. Advice would be leaving for Alaska, leaving me on the roof. I am used to the outdoors, I am also used to hard work, but I felt this was an impossible thing to ask. I thought he must have been joking, but quite early on a very grey and dismal morning two days later, Dr. Advice tapped me on the shoulder as he was leaving, and said “Your boss is here”. And so, the patient old man and I put the new roof on the house, and in a week’s time, he pronounced it sound and drove away in his dusty old pickup. No accolades for the magnificent job I had done, also no surprise. As the summer wore on,we learned many northwest tips. Our new Swedish friend taught me not to work on the wet grass after the rain because it brings more water to the surface. Don’t set traps for moles. Just bang on the ground with a shovel, and when they surface, trap them in a glass jar and release them in the pasture. I learned that rubber boots were a necessity for digging ditches when I accidentally chopped a large root and released a buried creek. When I dug a ditch down to the back fence which backed up to a horse corral, I found I had to go into the corral, and chop through about 4 inches of frozen soil to go through. We hired a man with a back hoe to clear out a lot of roots and because of the creek running through the place, he sunk his backhoe and had to call for help. He cme into my kitchen to use the phone and said he had just lost his backhoe. We brought in tons of earth for lawn, and for weeks I crawled around on my hands knees picking up rocks to make it smooth. As soon as the lawn came in, we had night visitors. Two deer discovered our laden pear tree and chopped up the new lawn in the process. A neighboring horse down the road got loose one day and destroyed much of the lawn before trying to get back home. We built on a new room, became proficient at ditch digging, rewiring, planting, painting, and beginning generally to turn the old neglected place into what we had dreamed. We soon learned that there are other fishermen such as ourselves, and that many of them are electricians, plumbers, earthmovers or solvers of many other problems we faced that first summer, and were unavailable for days at a time just as we encountered problems. This was the way of country living, so we also learned to either relax and go fishing until their return, or tackle some of the other problems in the meantime. Warm days and nippy nights brought our first Fall, bringing with it football games, and incredibly glorious red and gold leaves piling up wherever you looked. unbelievable color to be savored and raked. We turned our attention to the inside, and fruit and jam canning, bread baking , and generally making ourselves into country folk waiting for Spring. Altogether a most satisfying summer. I apologize for cutting picture of Russell Andersen in half in the last post! I’m sure no one noticed, but if he were here, he would notice and wonder what happened to the rest of him! Rancher Russell Andersen, Sunol, Ca. It promises to be a crisp and sunny day when the early morning mist lifts off the spring green hills. The live oak trees show their new leaves sheltering all manner of wildlife including the chirping of birds greeting the new morning. 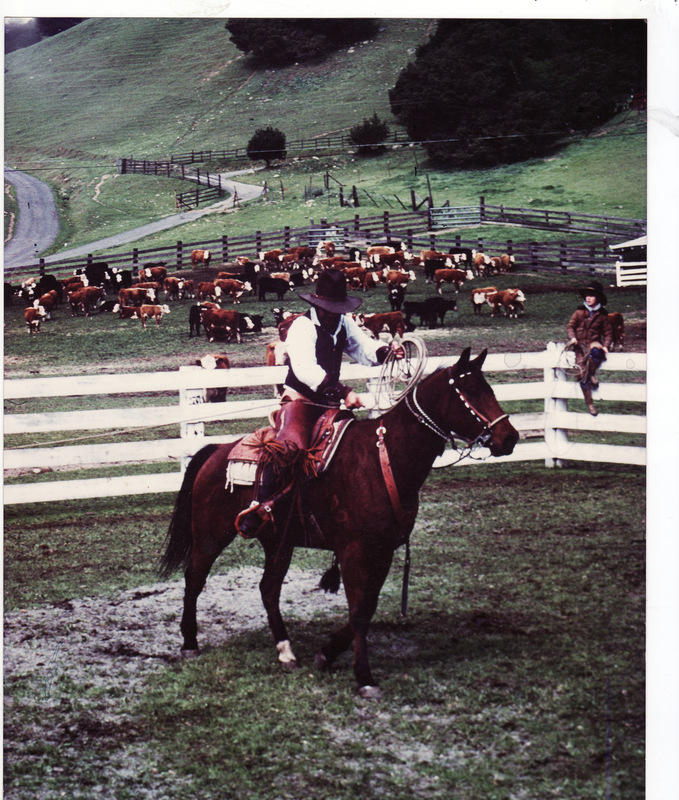 It is the annual roundup at the Andersen ranch in Sunol, California. Russell Andersen is our cousin, and late March and early April are roundup times in Sunol. The Rasmussen/Andersen roots grow deep here in this valley, since grandfather Peter Rasmussen arrived from Denmark in the mid-19th century. Sunol is a tiny hamlet nestled below the hills, and besides a few ranches, includes a small elementary school, a Little Brown Church, a couple of coffee shops, and a railroad station for the railroad which runs the few miles between Sunol and Fremont. The bustle has been here since before dawn, as this is a job which needs to be finished before the day’s end. Cowboys and vaqueros from Mexico, with their colorful outfits and silver tack are rounding up the cows and their calves which are to be branded with the RA brand, the steers to have their horns clipped as well. The cows are left in the pasture and the calves are pushed, pulled and otherwise coaxed into the branding pen. There is a cacophany of shouts and goodnatured ribbing as a calf gets loose, and is wrestled to the ground. The branding irons are heat red-hot to put the RA brand on each calf. Boys are hanging on the fence as two of our grandsons once did, dreaming as many country boys do of becoming a cowboy. The cows are nervously calling and stomping their hooves, and the calves are bellowing in answer at the indignity of separation from their mothers. As each one is branded and/or clipped, it is pushed out find its mother. Amazingly, they find one another in the confusion, and rush off into the pasture. The roundup is truly an American institution, since the settling of the West. In the house at the top of the hill, women are preparing food for upwards of 25 men and boys. Whole families have come to help, and there is a large barbeque of beef, huge bowls of salad, pots of beans, casseroles, and good crustly bread to soak up the juices. Libations flow freely, and as the first empty pots are cleared away, pies and cakes arrive to accompany steaming mugs of coffee. It has been a long , hard and dirty day, and as the first crew finishes, they call out goodnaturedly to those remaining. Finally, after the feast, the horses are gathered to load onto their trailers for the ride home. This ritual will be repeated the following week until all the valley has finished the branding. Neighbors helping neighbors, much as country people have always done. The life of a cattleman is not prosperous, since the land is too valuable, and a more lucrative living could be enjoyed by selling to the developers. But to these people, this is the only life they could live. “The retrieval of childhood experience is one of the most mysteriously unpropitious of human endeavor,” Janet Malcolm wrote, ” neither of the two ‘I”s through which the story of a childhood is told is trustworthy.” But Most of the stuff I say is true because I saw it in a dream and I don’t have the presence of mind to make up lies when I’m asleep. Having clarified that, my mind can afford to ramble. Being in the military (Navy), we made an almost annual migration to many places within the United States. Often, when my mother went to be with my father for an extended period, I did not accompany her, and instead, went to stay with my great-aunt. I don’t recall being either happy or unhappy, and though an only child, I don’t believe I was spoiled. Of course, that may be my own opinion. Upon each arrival at a new school, it was my habit to change my first name. I had no repugnance to my own given name, but as I was always an outsider, I became an actress in my own play. The propensity began in the first grade when I was totally smitten with Jackie, a cute little redhead with dimples and freckles. Before her I became Hallelulia for a blessedly short time. Other schools and names took their place, and the next name I recall was Elsie, named for Elsie Dinsmore (a book) or Elsie Brown a girl who lived near my great-aunt. My Elsie was “born” when I was in the fourth grade in San Diego. I was able to live a secret life for most of that semester until a census taker arrived and informed my mother that she had two children; Kathryn and Elsie. After her disappointment in my duplicity, Elsie suddenly disappeared. Also during this year I suffered what should have been, (next to having my name change caught out), my deepest embarrassment. The school held a talent show, and I signed up to play a selection on the piano. In addition to no particular skill in eiher singing or dancing, I also could not play the piano beyond Chopsticks. For my first selection, I chose a heavy duty ” Russian” piece. Needless to say, I was booed off the stage. We lived in San Diego, which had been the site of near-disaster at the age of four when twin boys of six enticed me into a deep ravine near the San Diego Zoo and left me. My memory is not one of fear but rather of anger amplified when the police found me sometime after dark. I was given a boxing lesson the next day and threatened with punishment if I allowed anyone to treat me so again. My first opportunity to exact revenge came shortly thereafter, and after delivering a few good punches, I was never bothered again. There were other name-changes, but not until the 10th grade, did I come up with the first original name of “Arvie” made up from my own imagination. I truly loved that name, and would have kept it if the War had not started and we moved. I was sent again to live with Auntie, a no-nonsense New Englander, who would never have understood my need for anonymity. That was the year I was forced to grow up and accept my own identity for what it was worth. Why would a quiet, well-behaved child choose to play-act her fantasies under a new name in each new location? Perhaps loneliness or a feeling of inferiority, or maybe just an opportunity to escape from a life she did not feel a part of. As adults, we cannot know what is in a child’s heart or mind. Most fantasies are harmless, and end with childhood. We do what we can and hope for the best. Author kaytisweetlandrasmussen83Posted on April 12, 2011 April 12, 2011 Categories Words of Wisdom5 Comments on What’s In a Name? Growing up in Los Angeles during the Depression made one deeply aware of the movie industry, and the great “real” movie stars. Their faces were on movie magazines, newspapers, and movies were an affordable entertainment on a Saturday or Sunday afternoon. Everyone wanted to grow up to be a movie star. It was the era of Shirley Temple of the dancing feet, ringlets and dimples. Shirley and I shared the same birthday month, and though we did not share the dimples or the ringlets, my grandmother saw no reason why I could not be taught to sing and dance. There were no beauty pageants as such, but Baby Parades were pretty common, where proud mammas dressed their little darlings in tiny costumes and entered them in local parades. It certainly helped if the child showed some talent. Alas, I merely marched in my beauty pageant attire, so I was promptly enrolled in dancing class. Surprising everyone but myself, I showed absolutely no gift nor lightness of foot. Though a tiny child, my dancing was akin to the proverbial bull in the china shop. My mother mastered the curly hair by coaxing my straight hair into a semblance of ringlets with strips of rag, and a curling iron. Visually, I was a cute kid with no talent. My idol in the class was Nancy Joy, whose mother surely epitomized the well-known stage mother. Nancy Joy was pretty, fairly talented, and her mother was certain she would become at least as famous as Shirley Temple. She also had attitude, considered a necessary attribute for fame and fortune. I, on the oher hand, much preferred climbing our fig tree or the neighbors’, or re-enacting the latest Flash Gordon movie. So for a few years, reality reached my mother and grandmother, and I followed my own path of childhood sloth. Around the age of eleven, I showed some promise of possessing a fair singing voice. Besides the movies, radio was our entertainment. It was the day of comedy, with Jack Benny, Fibber McGee and Molly, Joe Penner, and now and then, a female vocalist. I spent my pennies on sheets of lyrics of the popluar songs of the day, and learned them all. Singers such as Deanna Durbin and Kathryn Grayson were featured in the movies. I sang my heart out in the bath, because the acoustics are amplified by the tile and the bathwater. (I just made that up, but it sounds reasonable.) Being a determined woman, my grandmother somehow convinced Deanna Durbin’s singing coach to listen to me. An interview was arranged and I had a permanent and new clothes, and off we went to allow the great man to hear my voice. I sang “My Sweet Little Alice Blue Gown” for him, and he reacted favorably, assuring my grandmother that my voice was at least as good as Deanna’s before she came to him for coaching. Engaging him as a teacher was out of the question because of the money involved, but we hastened to another teacher who was cheaper and closer to home. So as things turned out, I can neither sing nor dance, I have very unpeasant hair,—–But I do have a sense of humor, and I suppose in the scheme of things, that is more important.